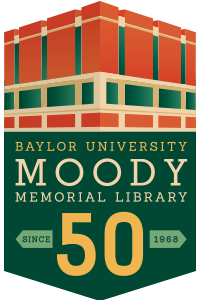 In 2018, Baylor University celebrates the 50th year of Moody Memorial Library. As the main library for a campus of 17,000 students - plus hundreds of faculty and staff - Moody's importance to the Baylor community has only grown since its doors opened in 1968. The Baylor Libraries celebrated Moody's 50th birthday in style on September 14, 2018 with more than 500 of our closest friends! Read up on the proceedings over at Promoting Discovery, the official Libraries blog!